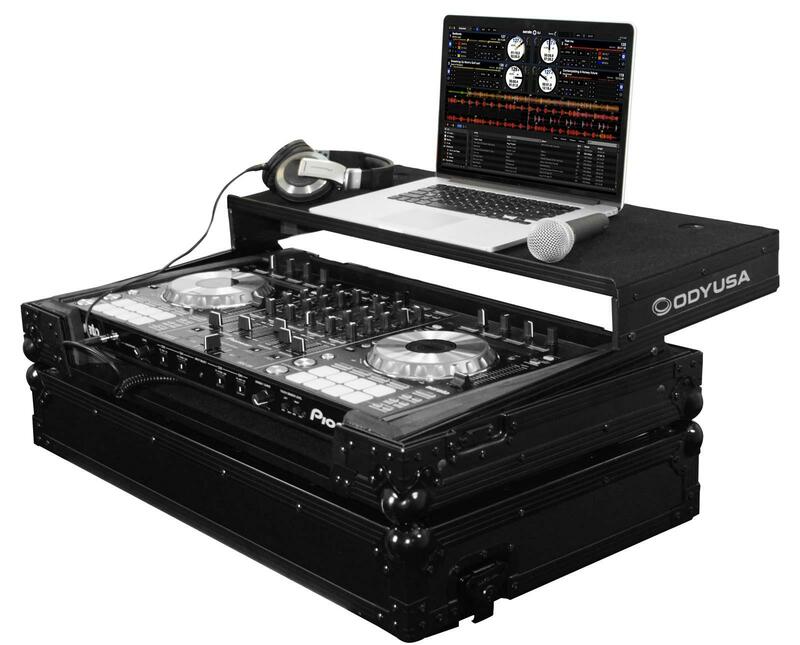 The Odyssey FFXGSPIDDJSXBL is a Flight FX Glide Style Case for Pioneer DDJ-SX, DDJ-SX2, DDJ-S1 and DDJ-T1 controllers. Odyssey presents the Flight FX™ Series FFXGSPIDDJSXBL case featuring our patented Glide Style™ laptop platform design. Specifically made for the Pioneer DDJ-S1, DDJ-T1, and the long awaited DDJ-SX DJ controllers, it also features our exclusive, patent pending, high-density bevel foam interior that neatly angles upward raising the controller for an efficient control surface. The stylish V-Cut™ removable panel allows for easy access to the front controls and headphone/mic jacks. A spacious ventilation pit under the controller is ideal for storing cables and other accessories. The ordinary has become extraordinary with Odyssey's Flight FX™ case series. Embedded into the case wall is a color changing multi-mode LED panel that runs across the front of the case. The panel can be set to any one of seven colors or can be set at a variety of color changing modes. For multiple case setups, any FX case can be synchronized to another by connecting the control boxes. 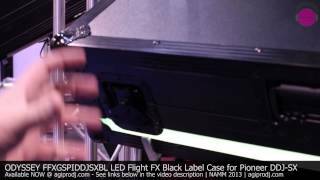 Each Flight FX™ Series case is constructed with the same black anodized and powder coated black hardware as our Flight Zone® Black Label™ cases complementing the visual aura of the glowing panel. Become center stage at any gig behind these cases. Innovating? Of Course! Another Spectacular original Odyssey Design. Just excellent!!! • Without the laptop glide platform (FZPIDDJSX & FZPIDDJSXBL). *Please note: Due to the redesigned size of the front LED panel, the ODY logo no longer appears on this case. 32.5" x 9.25" x 19.75"